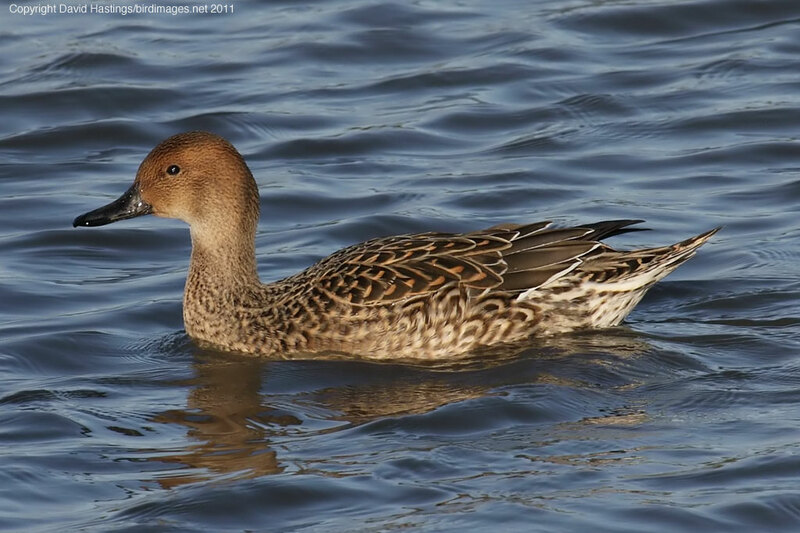 Pintail (Anas acuta). Male. Taken at Slimbridge, Glos., on January 17th 2019. Male. Taken at Slimbridge, Glos., on January 17th 2019. Pintail (Anas acuta). Female. Taken at Slimbridge, Glos., on November 27th 2011. Female. Taken at Slimbridge, Glos., on November 27th 2011. 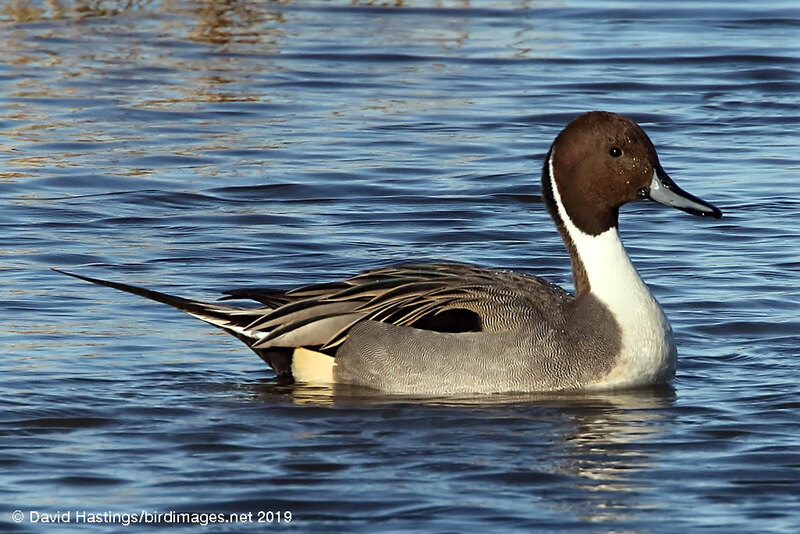 The male Pintail in breeding plumage has a chocolate-brown head and white breast with a white stripe extending up the side of the neck. Its upperparts and sides are grey, but elongated grey feathers with black central stripes are draped across the back from the shoulder area. The adult female is mainly scalloped and mottled in light brown with a more uniformly grey-brown head, and its pointed tail is shorter than the male's; it is still easily identified by its shape, long neck, and long grey bill. The male is considerably larger than the female. The Pintail is a widely-occurring duck which breeds in the northern areas of Europe, Asia and North America. It is strongly migratory and winters south of its breeding range to the equator. It breeds on lakes in lowland and steppe, and mountain and tundra pools. It has Amber status on the UK list, owing to the small number of breeding pairs (only a couple of dozen), and the significant winter population (around 28000 birds).